I'm trying desperately to keep all the meals crazy simple this week, ahead of our end of summer vacation. Literally, we're getting back in with just two days to spare between return and my daughter starting school back up. That's why I knew this was the perfect time to cook up some more of these Healthified Egg McMuffins! With plenty of eggs and sliced cheese on hand, it was really a no-brainer. 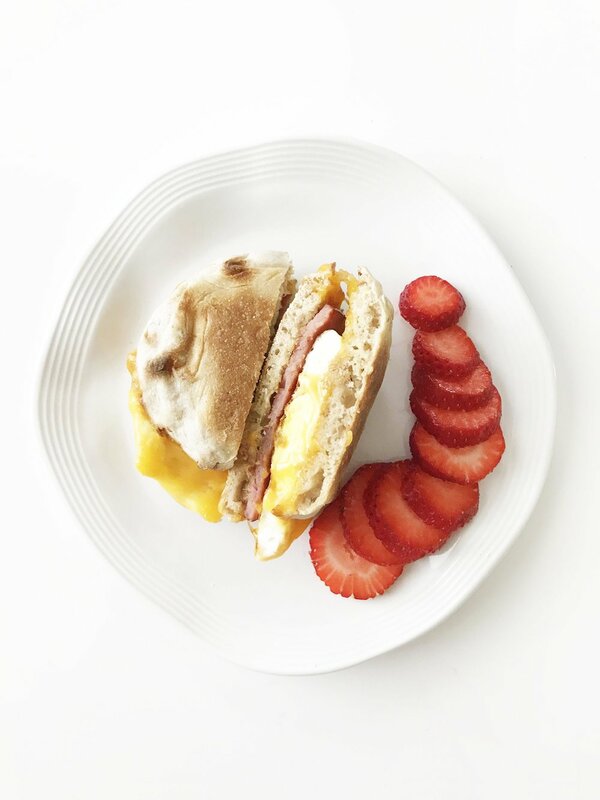 This breakfast is both kid and freezer friendly. I only made two this morning, but normally I make up a whole batch of 12; let them cool, wrap them up in individual sandwich baggies and store in a gallon freezer ziplock in the freezer. When ready to eat you just remove them from the freezer (and baggie) as needed, wrap in paper towel and pop into the microwave for a minute or two to reheat. It's the perfect meal-on-the go for those busy school mornings! Making this ahead and/or turning them into a freezer friendly breakfast, means that you have a quick and easy bite that's way better for you than the ones at the drive-thru. And you can rest easy knowing exactly whats gone into it. A homemade and healthified version of a drive-thru classic. 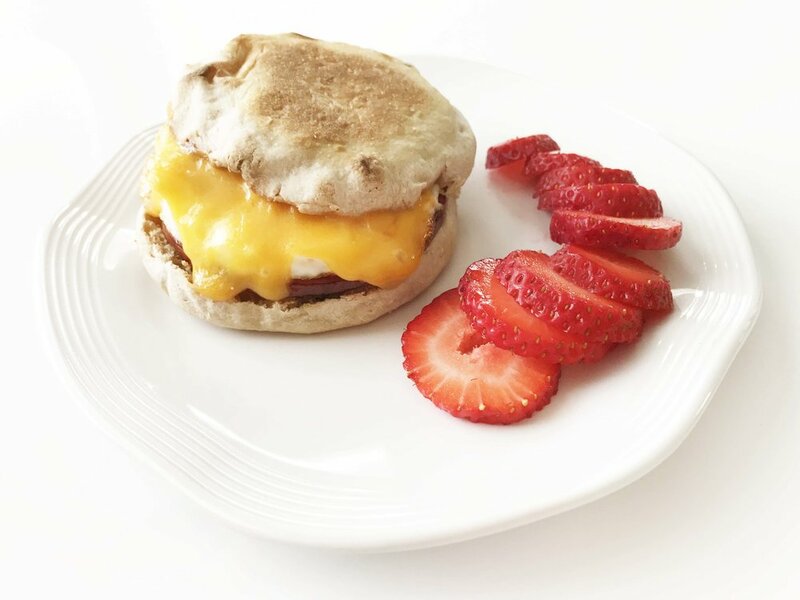 This breakfast sandwich is a cooked egg piled with cheese and turkey canadian bacon that's sandwiched in between a whole wheat english muffin. Meal-prep and freezer-friendly! Lightly spray two skillets with non-stick cooking spray and heat both over a medium heat. Place the needed amount of turkey Canadian bacon in one and cook according to package directions. Place the eggs in the other skillet to cook as desired. I cooked mine using a couple of metal rings in the skillet to get that well known rounded egg shape to fit perfect on the english muffin. Once the eggs are done, remove them from the oven and allow to cool slightly. Season with salt & pepper to taste. Toast your english muffin to crisp. 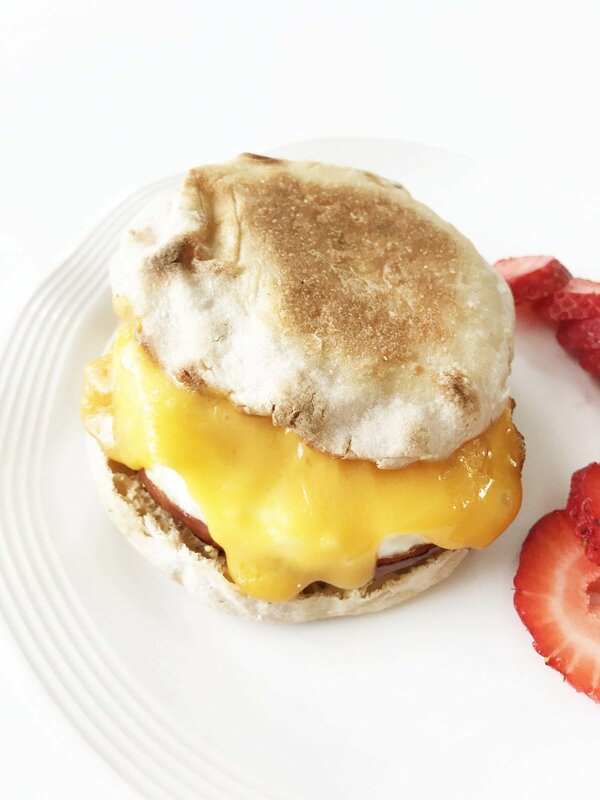 Put your breakfast sandwich together, layering cheese, canadian bacon, and egg on the english muffin.